Introducing simple engaging and powerful new tools. Shopping. Come see how we’re changing everything. Earn loyalty credit when shopping at a business and redeem it the next time you visit. Earn Echo credit by filling out a brief survey and sharing feedback with the business and your friends. 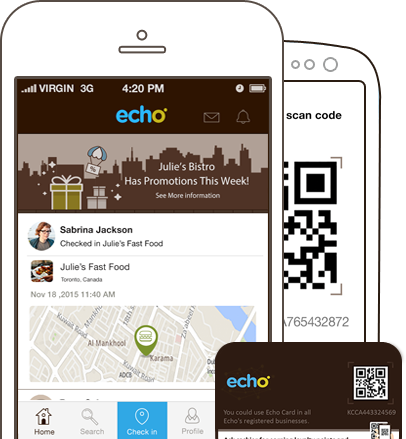 Refer your friends to your favourite businesses and earn Echo credit. Own a business? Give your business a loyalty program that works. The Echo mobile app is totally free. Download it now for iPhone or Android. Work with our team of loyalty experts to create rewards your customers really want. Learn how Echo can be a perfect fit for your business. © Copyright Echo Inc. 2019. All Rights Reserved.